$0.75/1 Wunderbar = $1.49 lb. At Price Chopper! Save $0.75 on ONE (1) lb. 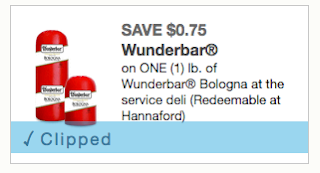 of Wunderbar® Bologna at the service deli (Redeemable at Hannaford) - this is $2.99 a lb. at Price Chopper = only $1.49 lb. after coupon doubles!